We put these caramel apple bars together this past weekend at our little weekend retreat in the middle of Nowhere, Wisconsin. It was one of those autumn weekends replete with sunshine, fall colors, and temperatures in the mid-50’s and low 60’s. It was Badger football weather and apple cider season. These bars were a part of it all and you probably have figured out that they were a wild hit with the boys. And their dads. Saturday found myself and the four juniors harvesting apples from our lone honey crisp tree from our yard in town. As one of the boys pointed out, our family effectively reaped the rewards of having our own apple orchard this season, all from the branches of a single tree. Just a a few short hours later that afternoon within the confines of our small lake cottage, some of the apples were beginning their transition to delicious apple butter that had our whole family basking in fall aromas, all night long – not a bad way to fall asleep. Or, wake up. While making a quick pit stop at the local grocer just six miles from the cottage, one of the boys emphatically asked to make caramel apples this weekend. Into the cart went a bag of caramels and out of the oven on Sunday morning came the caramel apples, in the form of these bars. Mix butter, brown sugar and shortening in large bowl, cream with fork. Stir in 1 3/4 cups flour, the oats, salt, and baking soda. Reserve 2 cups of oat mixture. Over low heat, melt caramels in small sauté pan, stirring occasionally. Press remaining oat mixture into ungreased 13x9 baking dish. In small bowl, mix apples and 3 tablespoons flour and spread over mixture in pan. Pour melted caramel over apples and then sprinkle with reserved oat mixture, press lightly. Bake 30 minutes or until topping is golden brown and apples are tender. Cut while warm, store covered in refrigerator. I love apples in dessert. Looks delicious! Thanks, Amy. We love apple as well! 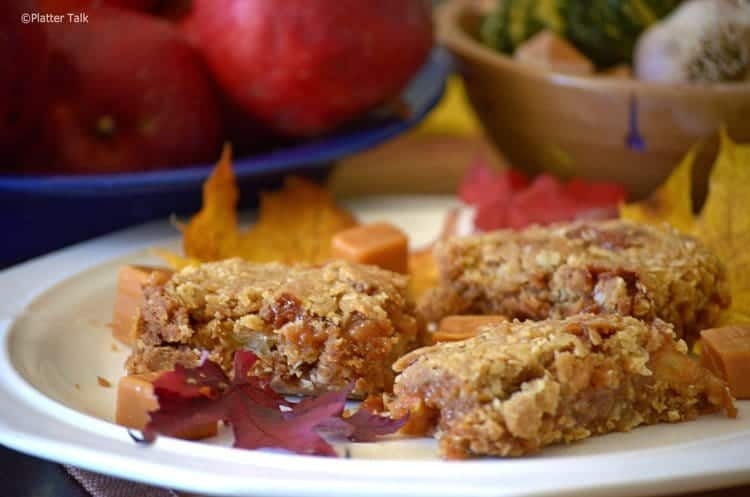 We were looking for a caramel apple recipe that was not just a “caramel apple” recipe. This is perfect!! 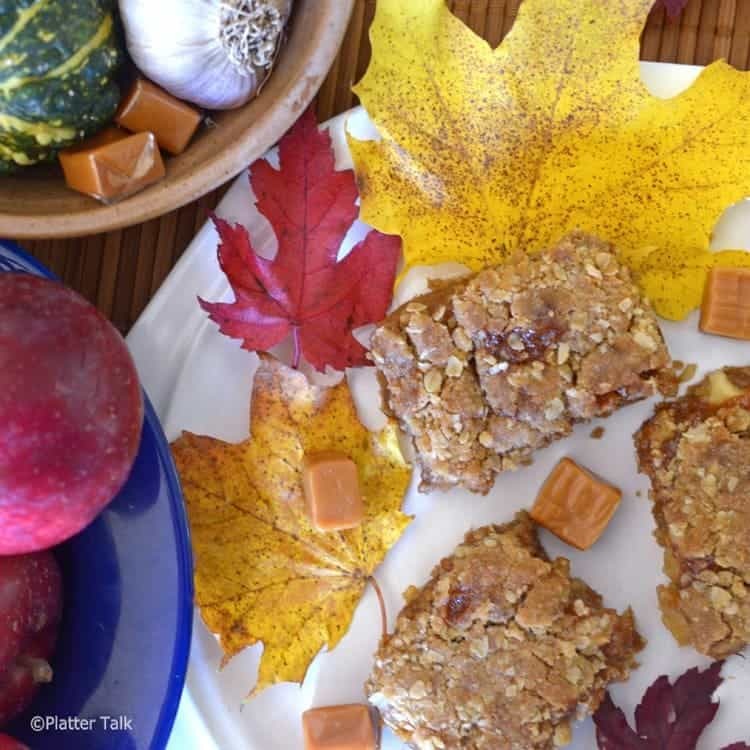 Love your use of the fall leaves in the picture too! 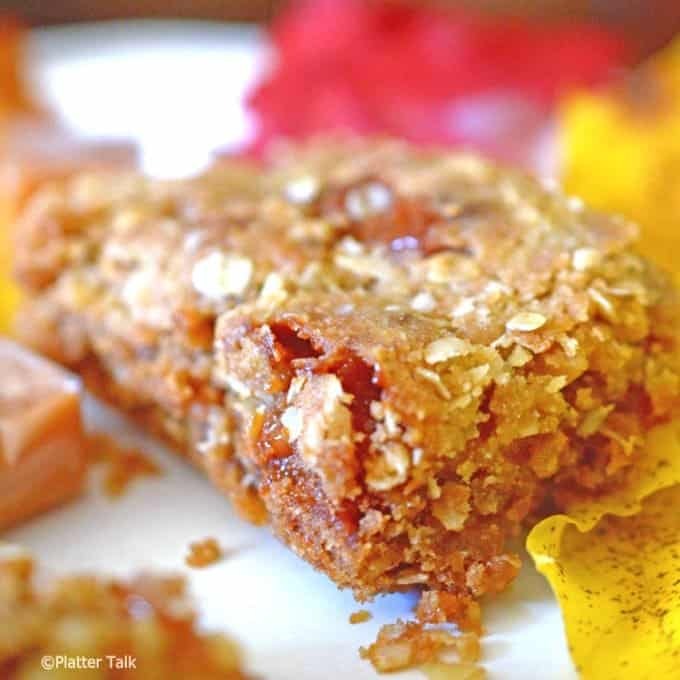 Thanks so much for visiting Platter Talk; we hope you try this recipe! Oh these look SO delicious! Perfect for Fall and the bushel of apples I have sitting on my counter! Thanks, Megan. Please give this recipe a try and thanks so much for stopping by Platter Talk! 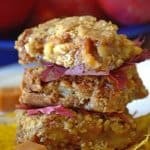 These sound delicious I am so ready for dessert…always eat dessert first just in case you are too full after the meal! I’m all about dessert first, Amanda! Thanks for dropping by Platter Talk. These look super yummy! 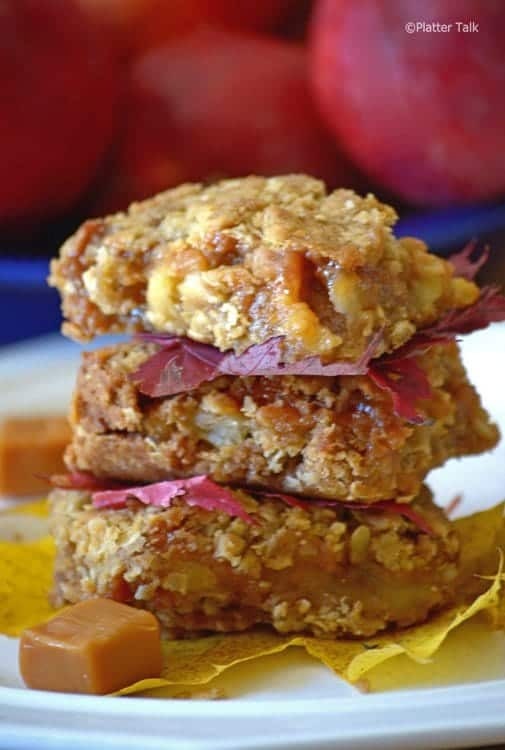 All apple and caramel and crumbly and yummy! Thanks for sharing your recipe. 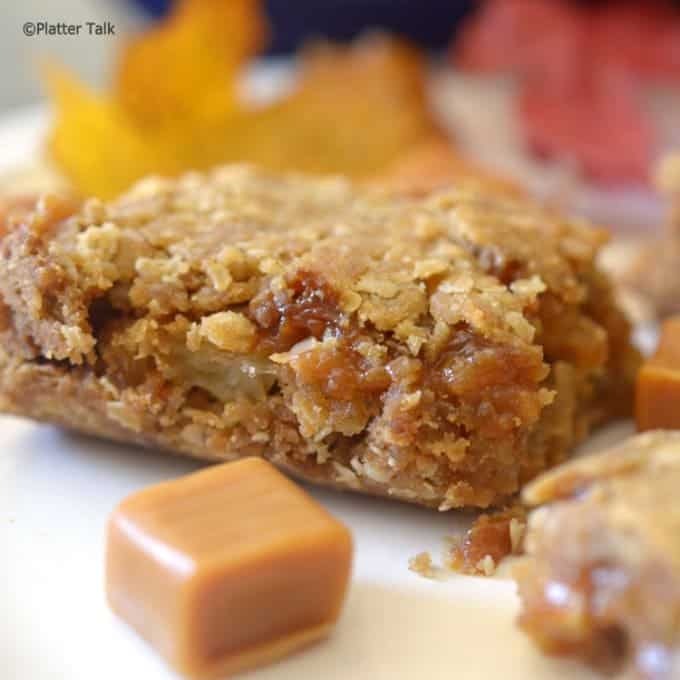 This caramel apple bars recipe looks superb. 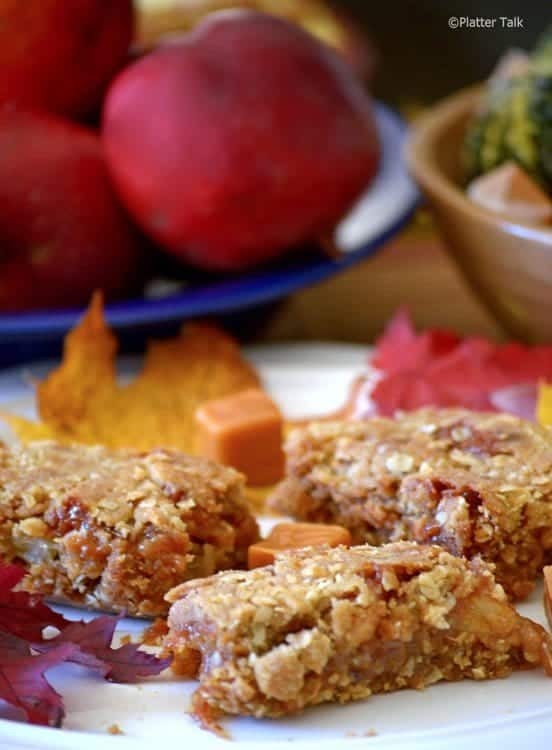 These look like an amazing fall dessert! I think this was a MUCH better ideas than caramel apples which is probably what the kids had in mind. No doubt they were not disappointed – who could be?